Most vets know that queasy ambivalence that comes when a well-meaning American tells them, “Thank you for your service.” The sentiment is sincere, but also a little bit feeble, maybe even something of a back-handed compliment. Nowhere near as bad as, say, being spit upon, but being told “Thank you for your service” still registers flatly—the words are inadequate to or ignorant of what the service actually entailed, what the recipient might actually feel about the matter, or the responsibility and consequences that might actually come with bestowing thanks. That’s a lot of “actually” separating the words, the ideas, the deeds, and the people involved. This conundrum gets writ large in Ben Fountain’s Billy Lynn’s Long Halftime Walk. About an infantry squad being feted on a two-weeks-long “Victory Tour” for their heroism in Iraq, the novel culminates with “the Bravos’” participation in a garish halftime ceremony at a Dallas Cowboys football game. For the most part observing the dramatic unities of game-day, Texas Stadium time and place, BLLHW takes place on Thanksgiving, fittingly enough, and in a down-at-the-heels football Coliseum Fountain describes as looking like “a half-assed backyard job” and suggestive of “soft paunches and mushy prostates.” The novel is focalized through the eyes of Billy Lynn, the most heroic of the Bravos and the one most sensitive to the Texas-sized admixture of adulation and condescension the squad encounters. The mostly white, mostly rich, mostly male, and very gregarious Cowboy fans are eager to honor real-live war heroes, but they don’t really know how to behave in the presence of actual—that word again–ragamuffin grunts. The soldiers’ valor in combat obviously gives lie to their own pretensions of manliness, and slights, misunderstandings, and awkwardness accumulate throughout the course of the novel. After outright hostility and confrontation ensue, the Bravos are hastened back (and hasten back) to war, and the tiny fissures of attitude and values that divide the serving soldiers and the homefront populace have widened into a Texas-sized chasm of mutual incomprehension and incompatibility. Indeed, though an issue here is one of the book at large: Billy is far too inarticulate in speech and inchoate in thought to be the vessel for the piercing social critique and linguistic pyrotechnics Fountain favors. Billy can barely remember what happened in combat, is confused by the notion that he is a hero, dreads going back to war, is helpless in the face of calamities that have overtaken his family, is unhappy at the game, and is preoccupied by his virginity, which he very much wants to shed. Getting laid is the only token of gratitude from a grateful nation that Billy really wants, and his failure to entice even one member of America’s collective womanhood to indulge him—on his own Victory Tour, for crying out loud—exacerbates his self-loathing and plunges him into periodic funks. “Billy, you’re flaking out on me again,” his squad leader cautions him repeatedly. Billy seems to be the kind of guy who always knows a little more or a little less than everyone else, but Fountain describes him as also possessing a sweet charisma that is respected by savvier male characters and which actually—that word once more–makes him adorable to women. Along with everything else, BLLHW is a love story, and though Billy doesn’t (quite) lose his virginity before heading back to Iraq, he connects physically and emotionally with an equally sweet and endearing Dallas Cowboy cheerleader. This plot line strains credulity, but is enjoyable nonetheless. A fleeting romance among the ruins seems to be the least Billy, for whom the reader has come to feel strongly, deserves–our tiny mountaineer makes it for a moment to the top. 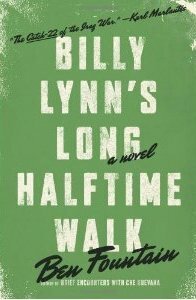 An audio clip of Billy Lynn’s Long Halftime Walk is available here.